collect, analyze and interpret the necessary Data (that is, the Evidence, often via Experiments) in order to verify or falsify (that is, to test) that Hypothesis. only then, publish the results (as a Model or Theory) and have them re-tested, often by peers. That is the only acceptable Technique to separate Truth from Belief, Science from Opinion, Superstition, Myth and Religion, fact from fiction, wheat from chaff. Worth keeping in mind when confronted with yet another piece of unproven conjecture. Mexico: Dr Leonardo Castillo from Mexico's National Fisheries Institute has begun equipping thousands of Sharks with satellite, radio and plastic tags to better understand the cause for a recent spate of incidents on the Mexican Pacific Coast. I look forward to his explanations after the results have come in, as it should be. Much more tedious than taking a quick trip to Mexico in order to give a few interviews - but oh so much more credible! Greenland Sharks: Canada's three Oceans are frequented by up to 41 species of Sharks. 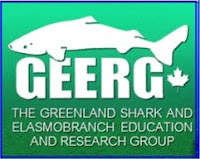 GEERG, the Greenland Shark and Elasmobranch Education and Research Group is currently conducting Research on 3 of them, the Greenland, Basking and Blue , and planning research on the four Lamnids Great White, Shortfin Mako, Porbeagle and Salmon Shark. As far as I can discern, no frivolous killing involved. The Canadian Shark Research Laboratory conducts research on some of the same Sharks, mostly by examining catches by local fishermen. Both websites are a treasure trove of information, along with a nifty interactive Shark identification key. And then, there's of course TOPP, the herculean effort of trying to tag, and thus record the movements of the Pacific Predators, be it cetaceans, fish, Sharks, birds or reptiles. It never ceases to intrigue and amaze me, be it by its sheer scope or by the wealth of information it regularly unveils. Plenty to discover, plenty to learn. Readers of The Song of the Dodo know that Islands are often homes to very large (as in the Dodo, the largest pigeon, on Mauritius or Dragons on Komodo) or very small animals. Case in point: the latest herpetological discoveries from the Caribbean. 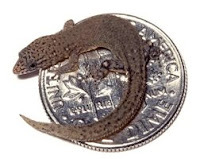 A small island off the coast of Dominica harbors the World's smallest lizard whilst Barbados, the smallest snake. So far, that is - as always in science, new discoveries are bound to loom. Like this one: researchers report the discovery of more than 100,000, hitherto unknown Western Lowland Gorillas (the kind mostly kept in Zoos) from two areas in the northern part of the Congo. Yes, they remain threatened by habitat degradation, the hunt for bush meat and Ebola, but it triplicates the estimates for the species nevertheless. Alas, no such good news for Sharks. But still, a good day for anybody interested in Nature. When one is marooned in the Friendly Islands that are currently suffering from acute Coronation Fever, CNN remains the lifeline to what's happening in the world at large. Imagine my surprise, and delight, when this special report popped up in the middle of a news program. Well written, filmed and narrated, it features SOSF scientist Alison Kock and her groundbreaking research about Great Whites. A further episode on Sharks, this time for Planet in Peril and featuring Mark Rutzen, has been announced for December. Great to see such a piece on mainstream TV - Shark Conservation has sure come a long way! And: he may be CNN's prettyboy, but Anderson Cooper is obviously a good Man. You can watch the special episode here and a video about the upcoming program here. And then, there's this slide show by staff photographer Jeff Hutchens - and check out his blog for more amazing images! This op ed from the Los Angeles Times is a must-read. As so often, first spotted by the guys over there at Shark Diver. Not because they're smarter - it's a matter of time zones. At least, that's what I believe. Nothing to add: just kudos to Joe Queenan for an excellent piece! As an aquarist, the following clip never ceases to amaze me. At first glance, it's just an ordinary scene of a fish tank during feeding time, with some fish skimming the food from the surface and a frenzy of smaller critters scrambling for the sinking leftovers. 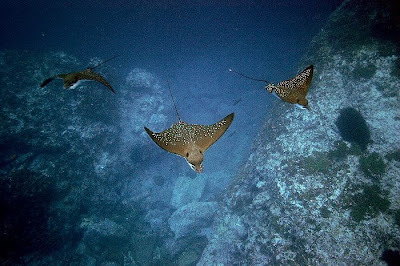 But upon closer observation, the surface skimmers turn out to be Whale Sharks and the frantic minnows below, Manta and Eagle Rays, Giant Trevallies and there are even several Giant Groupers like our Ratu Rua and Ratu Tolu! I have to confess that my knee-jerk reaction upon seeing it for the first time was that of any old-timer elitist. That is, righteous indignation. How DARE they imprison these wonderful animals, many of which necessitate habitats spanning whole oceans! How DARE they trivialize the magic of encounters for which yours truly had to travel the High Seas and brave the elements for years! But then, did I raise the same ethical objections upon seeing my first Big Cats and Bears in the Zoo? Many of which equally face extinction or require equally large territories? And how about the Apes, many of which were intelligent enough to grasp, and were clearly unhappy about their captive status? I had been, rightfully, sold on the notion that modern Zoos make a valuable contribution by raising the public's awareness of the need for Conservation and often act as repositories, or even breeding stations for the last individuals of particular species. Could it be the same for such Aquaria? The answer is unequivocally: Yes it is! Like most Zoo visitors who will never join a safari, most Aquarium visitors will never learn to dive and this is their only chance to ever witness those animals in person and acquire a special affinity and appreciation for them in the process. This particular institution, the Okinawa Churaumi Aquarium in Japan, has been successfully keeping Whale Sharks and Manta Rays since the late 80ies. One of their Whale Sharks has been on display for more than 10 years and recently, they were even able to announce the first-ever captive birth of a Manta Ray. All very convincing, and very impressive indeed! And let's face it: any contribution to changing the perceptions of the ocean-pillaging Japanese in particular, and Asians in general can only be applauded! Churaumi's pendant in the western hemisphere, the Georgia Aquarium in Atlanta, houses Whale Sharks, Goliath Groupers and even Great Hammerheads , along with a plethora of smaller fishes. They appear to be very active in Whale Shark Conservation and despite the indignant opposition of the tree-(or is it: algae-?) hugging faction of the scientific community, I must confess that I'm rather impressed by what they do. 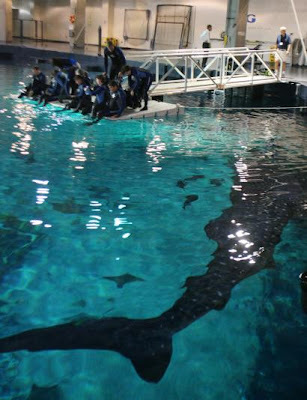 In their wisdom, the Aquarium has started a program allowing a dozen swimmers and divers a day to go swimming with the gentle giants. To put it in perspective, this compares with approx. 5,000 maintenance dives by the aquarium's staff each year. Obviously, the latter are necessary - but are the former? The customers are obviously extatic and bubble with superlatives about their unique experience. But the great Jean-Michel Custeau himself is not amused. Nor is the token Shark expert, supreme Shark attack, meteorological and now obviously, fish-keeping multi-guru George Burgess. Normally, the latter fact alone would be ample justification for me to join the faction in favor of the swimming - but I remain skeptical. Is there really any upside in throwing in a bunch of "divers" (check again...) at the risk , real or perceived, of harassing, or even infecting or otherwise hurting the already stressed captive animals? Apart from satisfying the customers' curiosity, and egos - and obviously, generating additional income? Is there anything to be learned from such an experience (thank you Jean-Michel)? Will Conservation profit from it? Let's be honest: it quacks like a duck and swims like a duck. To witness: "A diver named Kevin Chung broke into a flailing aquatic break-dance. " Indeed. It's just cheap and gratuitous entertainment, a silly and frivolous circus, a stupid afterthought. And demeaning on top of that. I ask: where is the Respect? But then, upon closer inspection, all those arguments in favor just don't hold up. Those aims can be equally achieved by keeping the public where it belongs. And that is, on the outside of the tank, to watch and not touch. In total Awe and Amazement. 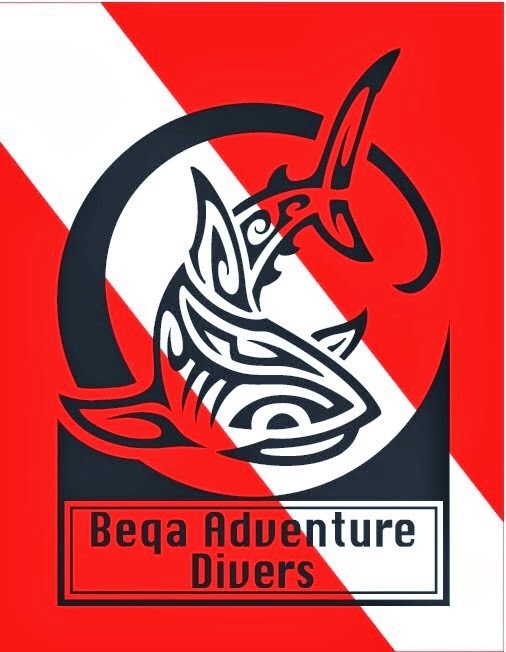 Have you ever dived the Pacific coast of the Americas? As in Baja, Cocos, Malpelo, Galapagos, even the Marquesas? 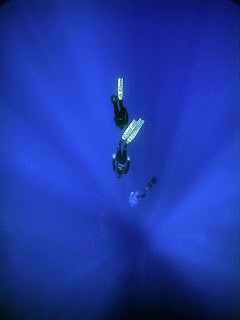 If so, you may agree that diving there has a very special "feel" to its own. The water is often black, the landscape is monumental but barren, there are ferocious currents and totally weird, and equally frigid multiple thermoclines, the weather is often challenging, the visibility often dismal. One would be tempted to argue that it's the very last place one would ever want to get back to, and yet I find myself going back time after time again. Not only because of its absolutely fabulous wildlife comprising some of the most iconic animals like Sharks, big Rays, Sea Turtles and Billfish - but very much also because of the unique challenges it poses. But despite squillions of dives and despite the fact that I've been an underwater photographer for decades before switching over to video, I've never quite been able to capture the eerie essence of those places. Yes, I have great silhouettes of schooling hammerheads and closeups of cleaning stations - but the reality is that most schooling hammerheads I've seen were not silhouetted, they were wandering along somewhere below in an spooky procession of tan bodies against a misty background, all much too difficult to be adequately captured I thought. 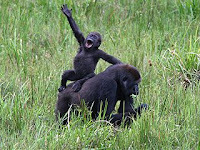 So far, that is - until I discovered this absolutely fabulous website. Record free diver Frederic Buyle takes his images on a single breath of surface air, on available light and down to a depth of up to a whopping 55 meters. 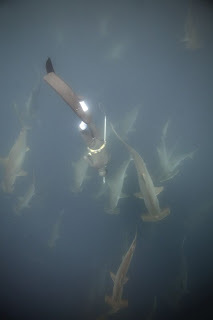 Take for instance this picture of the Smalltooth Raggie from Malpelo: if you're very very lucky, you may see them at 200ft on the Bajo del Monstruo, a huge challenge for any diver - and yet Fred did obviously succeed in doing so whilst free diving! I'm quite frankly blown away. I've taken the liberty of copy/pasting a few of my favorite images which you can click in order to see them in better magnification. Hopefully, they will result in some incremental business for Frederic. 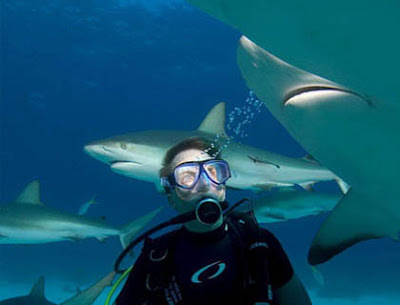 "Shark diving is a study, a long term study of animal behavior. Those in the industry who come to it looking to create a business quickly realize they are little more than wide eyed students-learning intricacies of shark behavior on a day by day basis. The teachers can be ruthless, but more often they reveal to us moments of grace and power based in lesson plans that were created over 100 million years ago. It's study that never ceases, school's never out for us, we learn from these animals each and every time we encounter them. 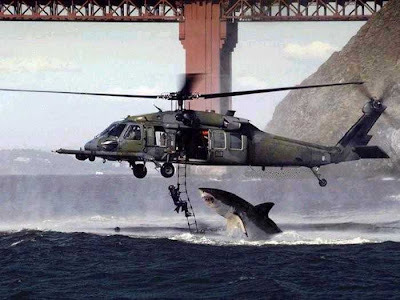 This is the nature of the business of commercial shark diving. 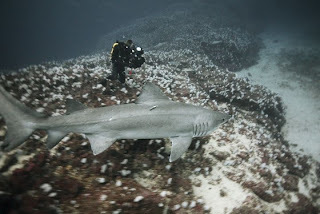 To make the bold statement that one is a "professional shark diver" is to infer that you have reached the peak of your career, that you know more about these animals than anyone else, that you have attained the level of "professional". It's a fools bet. 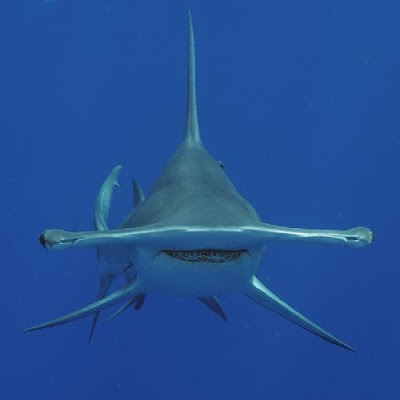 Sharks always have something to teach us and while commercial shark diving operators have come to "understand" the animals they seek - to call us professionals would be incorrect. To be self styled even worse. Do Buddhist monks ever call themselves professionals and carry business cards that boldly claim the same? No, they are monks, they continually grow and learn to become better monks, it's a lifetime understanding. I submit to you that commercial shark diving is a similar lifetime understanding. We are lucky to encounter these animals more than most folks, but we can never stop learning. If we do, if we declare a "shark vocation", then we divorce ourselves from what these animals have to teach us - and in the end will make critical mistakes that will lead to the darker teachings these animals are capable of."